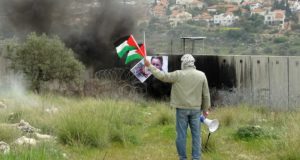 On Thursday, about 100 Palestinians, joined by international and Israeli solidarity activists, demonstrated in Ni’lin against the construction of the apartheid wall. 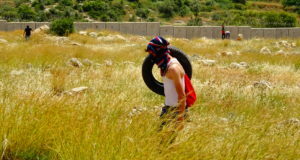 As the protesters arrived at the site of the demonstration, the Israeli army was waiting. When the peaceful demonstration started, the protesters were met with tear gas and rubber bullets, most of which aimed directly at them. Five people got injured by the bullets; one boy was hit on the head and one Canadian international was hit on the shoulder, leaving them bruised, but none severely wounded. Around 15 people had severe reactions to the tear gas. The demonstration went on for about two hours, and the Israeli army kept shooting at the protesters, even as they were trying to leave the area. 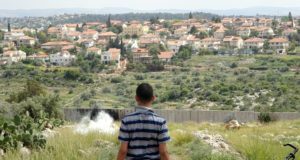 The people of Ni’lin are struggling to keep their land, from being confiscated by the construction of the apartheid wall.